The amount of firewood required in the northern forest in winter demands the use of an axe. Using a wood-burning stove uses much less firewood than sleeping in the open or in an improvised shelter but the firewood you do use needs more processing. To process firewood for a stove you need to be able to section logs into suitable lengths then split them into various sizes. While you can get by with just an axe, the use of a decent bow saw or buck saw makes firewood production much more efficient and safe than using an axe alone. You can easily section logs to the length you want and you waste very little wood. Then you must split the rounds to various sizes from main fuel down to kindling. Unlike staying in a cabin, however, when staying out in the forest in a heated tent you are unlikely to have the use of a chopping block. So, you need to have a repertoire of axe techniques that include being able to safely split logs on snow as well as easily produce kindling. The latter may seem simple but I’ve seen some frightening techniques where people are literally playing chicken with their own fingers. A canvas tent with a stove provides a warm living space but requires you to have the axe skills to process firewood on snow. Photo: Paul Kirtley. Injuries while in remote country are potentially much more serious than in your back yard and we should always take extra care. 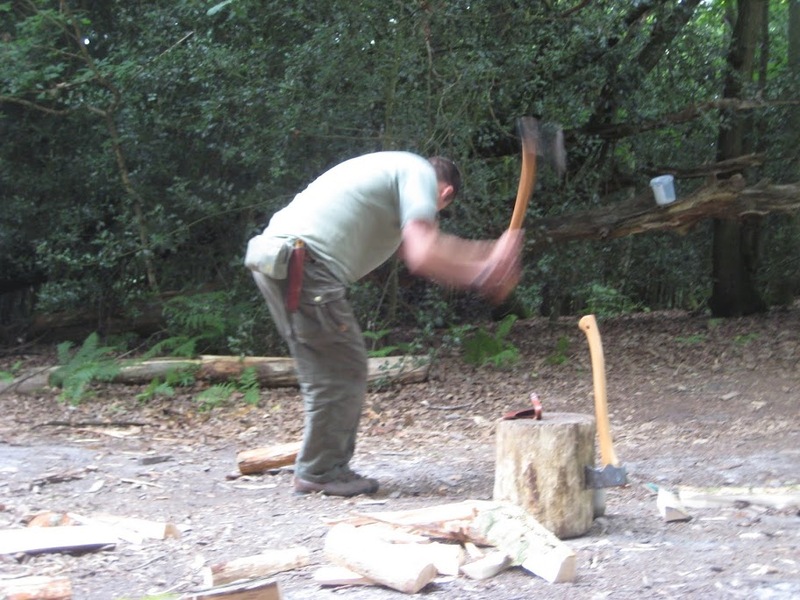 An axe is a wonderful tool for the wilderness traveller but it is also one to be respected. You should be mindful that even if you are used to using an axe on solid ground in warmer seasons, using an axe in winter poses extra risks. Remember that the snow is not as solid as the earth underneath it and will not provide as safe a backstop for the axe. Moreover, using an axe while on skis or snowshoes takes some getting used to – be extra careful and take your time. In winter, you may well be wearing gloves, which reduces sensitivity and possibly dexterity while wielding an axe. Also, beware the palm or fingers of your gloves becoming icy and making it easy for the axe to slip out of your hand. Even when I’m travelling by snowshoe and toboggan – which enables a significant load to the hauled – I keep my equipment as light and simple as I can. The axe I have often carried is the well-known Small Forest Axe by Gransfors Bruks of Sweden. These axes are made to high standards, very wieldy and eminently portable. The Small Forest Axe is large enough for two-handed felling while handy enough for small carving jobs and fine splitting. The Small Forest Axe is the axe used in this video and I wanted to show how this small axe can be put to great use for winter camping requirements. The Small Forest Axe, however, is a little short for limbing and sectioning while on snow shoes. An axe with a longer handle and a heavier head is the Scandinavian Forest Axe. This has more reach, is great to use on snow shoes and has more chopping power for felling and sectioning the tight-grained wood of the northern forests. Unfortunately, the handle of the Scandi is too long to enable the technique demonstrated in this video. So you have to choose an axe that suits the use you are going to put it to. An understanding of the range of axes available and the techniques achievable with each are the first steps to making an informed decision. A relatively short-handled axe such as the SFA lends itself very well to splitting firewood safely in a winter camp. I’ve produced the following short video to illustrate the main techniques I use for processing firewood in winter after a dead, standing tree is felled, limbed and sectioned. I hope you found the video interesting and enjoyable. Please let me have your thoughts on the video in the comments section. [You can also watch Axe Techniques: Firewood Splitting On Snow on YouTube]. Great to see an update on this blog site. Once again informative and a great addition with the video footage. Excellent, please keep up the great work. Thanks for your comment. It’s good to know you found the video useful. As always – great post and great info. Your blog is one of the best out there currently. I work in digital marketing as a strategist and have a few small pointers, if it’s okay. 1. The long intro is unnecessary. When making videos consider that for some people it might be the first time they see you. Speak in the intro, introduce yourself with a couple of words and get to it. If you need any texts then make them run across or appear in the bottom of the screen. 2. The video is a bit long. Now that is okay for true fans and followers of your blog, but for someone who doesen’t know you it might be off-putting. A good idea is to make the first minute or so about the general idea – show everything briefly. Then if people get bored they can leave, but they still saw what the point was. After the first minute or two you can go in-depth, show various alternatives and slow-motions. 3. If you’re serious about making videos, consider getting one of those small microphones that attatch to the front of whatever you’re wearing and that have a lot of hair on them. It reduces wind noise and usually there’s a lot of that outdoors. 4. You’re style of presentation, knowledge and credentials mean that making videos is a very good way of creating extra exposure. While Vimeo is sometimes a better video hosting site, YouTube has more visitors and therefore a larger possibility to be seen. Thanks for reading and thanks for the great blog. I really appreciate you taking the time to provide a critique and some professional insight. This video was certainly an experiment – both in filming and editing. We used only my small digital camera with no external microphone and I edited the small footage myself. If I produce more videos, I will certainly integrate all of the advice you have given. Thanks for letting me know you found this useful. Very nice detailed video. I have watch it, enjoyed it and learned some improvements from it. Good to hear from you! It’s good to know you enjoyed the video and learned something from it. Thanks for letting me know it was useful. It is nice to see instructional videos. It covers most of what is needed and it can remove in places, idiocy of people saying “I read this trick somewhere” and failing. The pointers you gave did make the video watchable. On youtube there are so many videos of people saying this is how it is done or they are “bushcraft”. The market is saturated with videos. Butthe one thing most do not have compared you you Paul is you have developed a following before your first video. There is not many I subscribe to on youtube but one I do recommend is Paul Canterbury who did Discoverys Dual Survival. With all this market business on the internet you have your own corner and that is why people Like Ray Mears, Bear Grylls who people consider “the famous face”, the idea of video gives you that corner. That small part of the web which has information, verbal communication and most of all showing how not to do it wrong. Keep the video idea going. You can have a basic level of bushcraft. Pointers on how to use a compass, read a map “and not a Tom Tom” and so forth. This could be a new medium for your followers to go with and when teaching, give an idea of how you teach so you can publicise your courses to a wider audience. Japan has ‘Kuden’: Oral transmission. Maybe this is your Kuden part of teaching. Thanks for sharing your thoughts. I’m glad you liked the video and found the pointers useful. That said, the aim of this video was to be instructional and show people technique in a similar way to how I’d teach it in person. Obviously a video is not the same as one-to-one instruction – being a student of martial arts, you will understand this more than most – but it does help people see what the technique should look like. I also enjoy Dave Cantebury’s videos. His attention to detail, and thoughtfulness, particularly when he’s questioning what’s really necessary, appeal to my way of thinking. I like the way he deconstructs and examines then keeps only what is necessary to form a workable whole. Thanks also for your suggestions for the way forward with future videos. The point of keeping your feet forward of the logs is a good one. Although once you’re tired, it’s easy to convince yourself that it’s not worth doing anymore. I wonder if shoes and feet split similar to logs when it’s really cold…? That’s a good point – even when tired, you have to maintain good form. The consequences of not doing so while using an axe are too severe. Corner-cutting should be avoided. This gets easier with time. When you’ve done this thousands and thousands of times, it is programmed into you. Until then, you have to make a conscious effort to check the safety of each cut you make. It was you who first taught me to use an axe and although I am fairly competent I found myself studying the video very carefully for those little details which make all the difference. Video will be a superb form of media for you , you understand what makes the various elements of Bushcraft ‘tick’ and getting those precise details over to us will be so much easier this way. I look forward to many more. I am already a fairly avid viewer of Hobbexp on you tube.His Bushcraft is very straight forward and simple but he sometimes leaves you asking a few questions such as – What made that technique work for him ? You answer these questions -it is in your Instructoral nature I guess. I am sure the quality will only get better – it is more than good enough now. When you’ve got the complilation video together the cheque will be in the post. More power to your elbow Mr Kirtley ! Nice to hear from you and thanks for your kind comments. It was many moons ago but I remember that course. The axe is my favourite tool and I always enjoy teaching it. I’m glad you think video works. I was a bit unsure – as you will no doubt realise having met me, I’m not the sort of person who naturally wants to get in front of a camera. But I figure, it’s another way of instructing and helping people improve their skills. And that’s what really drives me as an instructor – seeing other people develop their skills and knowledge and how enabling that can be. I haven’t seen the YouTube vids you refer to. I’ll check them out. Thanks for the pointer. This was not a cuff, far from it. The video was very interesting and show’s very safe splitting techniques. All this in the winter camp in snow, great stuff, you should be on TV Paul (Paul Kirtley wilderness bushcraft and survival series one to one hundred) we would all like to see that happen Paul. Good to hear from you – thanks for your kind words and support. I’m glad you liked the video – and the setting 🙂 It really is a wonderful environment to spent time in. Sounds like I’d better get my camera out again…. In addition to the tips stated above I have one advice for your next (or edit of this) video. The speed of the tekst should reflect the importance of the message. Nonetheless a really good watch! For some reason, your first comment ended up in the spam queue. Not sure why but apologies for the randomness of the technology. With a longer-handled axe (such as the Gransfors Scandinavian Forest Axe), you can’t swing it between your legs so have to do it off to the side (anyone reading this that hasn’t seen the technique DON’T rush out and try it!) – I think this what you mean by the “Tiger-Woods-swing” technique? Hooray for technology 😉 I copied the second text to be under my ‘ctrl+v’ if it again failed to show. Excellent, and very useful, as always. More videos please! It would have been nice to see your face first to ‘introduce’ yourself. Great info as usual…but now videos too! Will there be a set of DVD videos showing various bushcraft and survival skills available soon? excellent stuff as always Paul, thanks so much for your time and trouble. I am sure any obvious niggles like loss of sound in windy conditions will be sorted out, I sure wouldn’t want to criticize. thanks again. and looking forward to the next one. Thanks Andie, I’m sure things will get more polished. This was an experiment and it seems to have generated a lot of discussion and some good advice too. Glad you liked it and I’ll let you know when we’ve done another one. good stuff paul ,nice one ! Good vid fella n lovely settin. My issue with that technique is back problems. Constantly swingin bent over between the legs. Not sayin it aint good for anyone else just my back suffers so i have to give it a miss. I kneel down or make a platform or use a stump to keep my back reasonably upright. Get your vids whacked on youtube dude many more peepers view stuff on there. Nearly as nice a setting as your back garden (very nice lawn): I remember your YouTube vid on the ‘Marra’ bow drill technique and you working around shoulder pain. I’ve had students who have had to modify bow-drill technique in various ways (but not as significantly as yours). Same with axe techniques – you have to find what works for you (and remains safe of course). Thanks for the advice on YouTube. Will sort it out. haha. thats not my garden paul, mines a complete tip dude. i had to get permission to use that lawn, tho i cant use it no more as i left a larl burnt patch. oops. 🙂 Behind my tip/dump of a garden(never to be shown on camera), shed still standing but on its last legs is a field and a wood. If i threw a stone it would land in the river derwent where as a young grasshopper i spent many happy times learning to poach salmon, sea trout n eels etc with my family and friends. Money simply cant buy experiences like that. Nothing beats bein at home doin it with my family and friends. As nature intended and like native dudes all over this giant round garden. I still share these experiences and continue to poach and go nestin n foraging with my family and friends and very proud of it. The beautiful fells in the background 2mins to bass lake n 1 min to the solway firth to dip my toes in the sea. I feel very privaliged to live where i do. Not much concrete here. Winter, spring, summer or fall there aint many places i’d rather be dude. Great article by you and Barry on the cheap kit. Most excellent indeed thanx. Excellent video. Thank you for posting. Though I know it was not intended to be, your blog is nevertheless a wonderful supplement to my training at Woodcraft School (you helped me pass a heat and cold injuries test! [God, I hope that’s okay]), and another perspective on topics I’m studying in bushcraft only emphasises what’s most important to learn – so thank you! Considering you post for free, in return, perhaps sometime later this year, I’d like very much to attend a course of yours at Frontier. I’m particularly interested in trail-craft, or applied bushcraft, or maybe a ‘journeyman’ style experience, in order to consolidate what I’ve learned so far, and to throw the wilderness fantasy monkey from off my back once and for all. I believe applied bushcraft is a speciality of yours, and so I may need to request something bespoke along those lines, unless you can recommend an existing course at Frontier. I’m a currently a professional actor by trade, so though I’d like to offer some tips for your performance in future videos, it seemed to be just what it needed to be – simple and to the point. If, however, we could see your face a little earlier, it might perhaps help us connect as viewers just a bit quicker. Something about putting a face to a voice is reassuring, I suppose. Mainly, I’d like to reinforce what I thought you did right: well presented personally; spoke plainly but descriptively, and, by its end, the short convinced me that, most of all, you had the viewers safety in mind. Which, of course, is also reassuring. You have earned a failed actor’s seal of approval. Good luck with future posts. Thanks for such a kind comment. I really appreciate it. It seems that quite a few people want to see my face a little earlier (I really don’t know why! 🙂 ). As I think I’ve already mentioned, this vid was an experiment and all the feedback and constructive criticism I’ve received has been fantastic. I’ll be sure to integrate as much of it as possible in any future endeavours. I’m honoured that you couldn’t find much wrong with my presentation. There are some things I feel I could have done better but I’m usually my harshest critic, so it’s nice of you to say positive things – thanks for taking the time to say what you liked about the video. It’s great to hear that you’ve found my previous articles so useful in your studies. I can only hope anything I write in the future is as useful! As for training, yes I’ve always approached bushcraft with the aim of practical application and real-world usage. I came to the subject from the perspective of journeying and expeditions with a desire to learn a skill-set that lent itself to current-day use in wild and remote country. I feel this current day, real-world view is one of my strengths. I’ll drop you an email about training options. Excellent tutorial. Overall I have found the articles that you write outstanding and having the video enhances the information, as a visual learner it makes it easier for me to pick up the correct hints and tips. Thanks for the feedback. I particularly appreciate the comment about the usefulness of video for visual learners. I’ve always tried to provide very clear photographs on my blog but I completely agree that video – done well – can take it to a different level of clarity. very instructive video Paul, thankyou. Good axe and saw techinques are often over looked at the expense of correct knife technique so this fills a very important void..Did you notice a difference in the steel performance of the axe in such cold temperatures? Was it more prone to chipping,or did it require more regular sharpening? Glad you liked it. Yes, there is a lot of attention given to knives and teaching/demonstrating knife technique. Axe technique is, in some ways, more important. Certainly if you get it wrong, the consequences can be much more severe. Also, in environments where an axe comes into its own – such as the Boreal forest – it becomes the most important tool. When I’m up there I use a knife relatively little and an axe a lot. As for the performance, I haven’t noticed a difference in extreme cold. Theoretically the steel will be more brittle but with the Gransfors axes, it doesn’t seem to make any noticeable difference. What the cold does create a significant difference to, however, is the wood you are chopping. This is one of the reasons an axe is very important in the North. The growing season is shorter at higher latitudes and this makes trees grow more slowly than in the UK. A relatively small tree can be decades older than you would expect. The effect this has is that the wood is denser with closer rings. Dead-standing pine is relatively hard to take down and section with an axe but some of the straight sections are still a relative breeze to split. The spruce is tough and can be painfully knotty. Larger birch is gnarly and tough to split but this tends to be more of a woodshed/cabin issue, where the wood has been seasoned, than when you are out camping. Dead birch in the woods tends to be damp and not good firewood. Pine and Spruce are much better. Burning wood in a stove is relatively efficient. Staying warm by the fire for a night out in the open will require a whole pine tree with a trunk at least as thick as a telegraph pole at the base. So a sharp axe of top-quality steel is a real asset in the north. I tend to sharpen on a daily basis. It’s nice to see new posts in your blog. Video is super informative. I understood both techniques clearly. I wouldn’t understand so easy if I read about them. Looking forward to see new great articles from you! It’s good to see you here too! It’s also good you found the video informative – thanks for taking the time to let me know. Brilliant! Well instructed with excellent, clear video. Thanks Paul! Excellent video, I won’t repeat the critique above as that’s all ready been said. I found myself wondering if technique 1 could safely transfer to solid ground use for people who have difficulties with a more traditional technique. Although I think I will have to have a go myself to convince me that its safe. I was horrified at technique 2 but I had jumped the gun, Sorry Paul. Having watched it I think its a very good way of making small stuff and can only wonder why I have not seen or used it before, its that stage where I use an old knife of mine with a heavy blade, but your method with the axe looks superior. Yes, technique #1 works fine on solid ground. You may just have to raise the front face of the log up a little (0.5 to 1 inch/1-2cm) with another smaller piece of wood. Technique #2 works well wherever you have another piece of wood to work across or, even a chopping block. I certainly find it quicker than using a knife. Paul, Excellent work. That was really informative. Glad to see you posting again “Mr Spielberg”, excellent. Guid. I could listen to the sound of the wood splitting all day. Its right up there with crackle of a fire. More vids required they are an excellent learning medium. It’s a good noise isn’t it? Very satisfying when you crack a piece of wood like this, particularly the somewhat more intransigent pieces. The video was excellent, thanks for sharing these skills, I look forward to many more. Just one thought, I know you are modest person and that is one of the things that attracts me to you personally, your website and email list etc. and will be one of the reasons I will ultimately be signing up for your courses (as soon as finances allow), but I do feel that having your face in the video along with some sort of personal intro to the topic, obviously in a British, non cheesy way if you know what I mean would help with making a more personal bond with the viewer, I am sure this personal appeal is one of the reasons I am now hooked on watching certain youtube channels including Dave Caterbury. Keep up the good work it really is appreciated and I can see noted by many online, who I am sure are feel just as fortunate as me to find such a trustworthy source of information and guidance. Keep up the good work I know you will be well rewarded. It’s good to hear from you and thanks for your kind comments and praise. It means a lot to get good feedback like this. I’ve always aimed to be as clear as possible with information and skills on this blog and I hope I can replicate this clarity with any videos I make. Also, as I’m sure you know, I enjoy photography and try to provide really good images to accompany my blog articles. In providing video, I also wanted to produce something to the same quality standards as people have come to expect from the rest of my blog. Vimeo seemed the natural choice for video hosting. I will take the advice I have been given here and put video on YouTube too. But the embedded videos here will be on Vimeo because I think the quality is better – both in terms of providing HD video and the controls, etc. I also enjoy Dave Cantebury’s work on YouTube as I know quite a few others who have commented do. I thought your video was just great and showed very well. The only comment I have is that the last section with the points of note before the credits I thought scrolled a little fast to read and take in, otherwise brilliant and I can’t wait to see your next ones. Thanks for you comments. I’m glad you enjoyed the video. I agree with you about the scrolling. I was just trying to keep up the pace but in retrospect it does run a little too fast. It’ll be better next time! I really like you instruction video, nice and clear. Good tip to use a block as kind of stopping block. I didn’t know that trick. When i have to split a lot of wood I use a tree trunk instead of the block, that works very well aswell. Good to hear from you. Thanks for you comment and the extra tip regarding using a tree trunk. Great vid! Like many others, I was wondering when you were going to post something new. I could have done with this a couple of weeks ago. It wasn’t snowing but nothing big enough to use for a chopping block. Glad your posting again and looking forward to more videos. Good to hear from you. Glad you liked the latest offering. I’ll be posting more new material in the coming weeks. Excellent video Paul. Very well done. The angles of the shots showed all the detail very well, and the running commentary explained everything very clearly indeed. You being a professional instructor certainly shows in the educational value of the video. To me the only improvement you could have made to it, was instead of having the remember section at the end as text, you could have had a shot of you sitting down and talking through that part, I think that would have ended the film much better, it would also have got the safety points mentioned across better as people do tend not to take as much notice of text as they somebody speaking. Either that or slow the scrolling or space it a little more, slower readers would really struggle to keep up. I have seen a couple of comments about youtube, and I have to agree you would soon get a big following if you posted videos there.I sincerely hope you do more, from what i have seen so far they will be exceptional. I think a full length dvd would be a very big hit too. I think you make a really good point about the scrolling at the end. I like your suggestion of sitting down, facing the camera and making or re-iterating safety points at the end. I agree this would have been much better. We filmed a small amount of footage as an experiment. I did all of it off the cuff without any planning. Overall it seems to have gone down well but there are certainly areas which could be improved upon. Next time it will be much more planned and, I hope, more polished. Have to agree that video is a great medium and that Youtube is a great platform (the comments facility can work both ways in my mind though). Pleased to see that you’ve acknowledged peoples critique too. I must admit that a seperate microphone did make a huge difference when I was filmed as there were planes, helicopters and crows doing their best to put me off and you can’t hear any of them. Thanks for your comment. Good to hear from you. I’m very grateful for everyone taking the time to offer up critique and suggestions. I will certainly be looking into better microphones for any future efforts. Fortunately, in this instance there wasn’t much background noise where we were other than a fairly strong breeze. There’s no noise pollution there and it was still very quiet in the woods, most of the migratory birds not having returned yet. Only a few Ravens around along with Siberian Jays, Ptarmigan and Capercaillie. I have been all over North America camping and vagabonding about, and for all I’ve seen; Paul Kirtley and Ray Mers are the best of the very best. They’ve taught me as much if not more just over the internet than my own military grandfather ever showed me in person! These guys know their craft! Paul, thanks for the advice on my project too, I look forward to showing you my finished idea, and I also appreciate you doing some wood-based video, this is a real treat and I learned something! That’s high praise indeed. Thanks. I’m thrilled you got so much out of the video and my other articles. I look forward to seeing your finished project Jeremiah. Thanks for taking the time in producing and posting the video, I know that the information will really come in useful, I love taking my children out and it’s always great having extra information which helps with safely using some of the tools they encounter. Once again THANK YOU. It’s great that you get out with your kids. I don’t know how old they are but I would be cautious of introducing them to technique #1 too young. It does require a decent about of control. Personally, I wouldn’t tend to teach this technique to anyone under the age of 16 years, unless they had grown up using an axe on a chopping block on a regular basis. Technique #2, however, is a very safe method for anyone with the strength to hold an axe with one hand. The movement is very restrained and the axe is not moving too dynamically or near to the users body. Thank you for the reply and the valued input, my children are 16 and 11, I only ever let them use knives and anything with an edge under supervision. I made sure they had a healthy respect for anything like that before they even got near to them. They’ve had the concept of anything with an edge that you have got to ‘swing’ to use, deserves utmost respect and total concentration. They would say I nag them, I say I’m just making sure they understand the dangers before anything nasty happens! Hi Paul, great video, thanks. From someone that had a mishap with an axe earlier this year it’s good to see someone taking so much effort over the safety. I slipped while splitting up a log to make feathersticks and hit my thumb with the axe head, severing the main tendon. A couple of operations and a few months later and I have about 75% of the movement back but it’s a stark reminder to respect the axe as a potentially highly dangerous tool and a video like this is a brilliant visual reminder for anyone, both novice and experienced alike, to use an axe properly and safely. I’m sorry to hear about your ‘mishap’ but glad you are on the mend. Thanks for sharing the story and let’s hope it’s a sobering lesson for anyone reading it. These practical video’s are great to watch! To prevent my axe from slipping in winter conditions while wearing gloves is by wrapping the end of the handle with the inner tube of a bicyclewheel. I keep adding tube until it looks like a bouncing ball. This provides excellent grip. I just make sure I clean the handle well afterwards. Thanks also for sharing your inner-tube tip. Thanks for your message. Good question. With hand wear, there is a trade-off between warmth and dexterity. Mittens are warmer but have lower dexterity than finger gloves. While I’d be happy to chop a dead standing tree while wearing mittens, the splitting technique in the video above is quite dynamic and requires a sure grip on the axe handle. I’m not sure I’d keep hold of it 100% of the time while wearing mittens. Also, when you are doing many of these manual chopping jobs, you get quite warm. I don’t want to be sweating into my mittens as they are my backstop handwear that will save my hands. So for this type of job, I’d rather wear finger gloves for this reason and for dexterity. I use Hestra Fält Guide Gloves. I always take a spare set of inners for them too. Don’t buy the brown/black version. The leather is not as durable as the original white/tan version. I hope this helps answer the question Craig, but if you have further questions, please let me know. Brill instructional vid Paul as always. Standing in front of the face to be cut obviously a good safety tip but usually overlooked. Really good idea to bring both pieces down together to split smaller pieces and you was kneeling down to put your centre lower to avoid glance offs. Very detailed VIDEO! I enjoyed it very much! I teach some winter survival and Wilderness First Aid. We do a few winter trips every year and like to spend a few days on the ice or tarp lean-to in the snow. We always put a small woodstove in the pulk. I really liked the snow backstop idea and the safety aspect. Wisconsin snow cover is usually not very deep in sheltered areas, so I usually work againot a fallen log. Great safety points. My uncle cut off his great toe using unsafe practices. Wood I find is never that easy to split! Your blog fits my interest better than any I have found. Thanks for putting in the time. I have seen people running in a circle, I have seen people some where eating soup with sticks. And, I unfortunately forgot where, I have seen total crazy ones, driving with their cars on the left side of the street! — But why not, if they like to? But you seam to be such an intelligent guy. Why do you not construct your tent nearly next to a dead tree, only a bit away from the forest, saw in the trunk in falling direction horizontal, hack out the triangle, saw in the opposite side horizontal, throw then the tree on the side, clean the trunk to a nice flat table, process your firewood there on top very comfortable, tie the wood on the toboggan and bring it to your tent? Isn’t that far easier than doing it like I have seen it in the video? Or do you use that tecnique only if the circumstances do not allow to do it in my way? Or are you so sporty, that you do not feel, your tecnique would be uncomfortable? Sometimes a good camping site happens to have a dead tree very nearby. Sometimes they are a little further away. Of course you should always look to see if there is some dead wood relatively nearby else it is not a suitable camping spot, even if other attributes are present. Indeed there may be several dead trees in one localised area. This is often due to the same factor which killed one tree, killing the others too. Encroaching water is one reason but there are others. In this case it would be a bad idea to camp too close to the dead tree you wanted to take down as there would also be other dead trees in the area. As a general rule camping under or very near to dead trees is not a great idea. 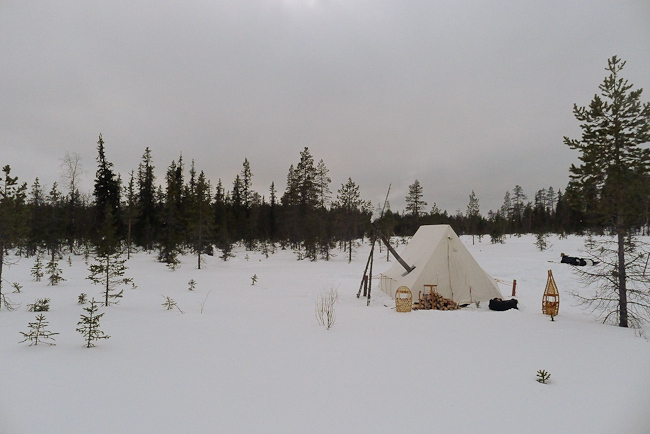 Without going into every variation and campsite parameter such as fishing, water access, localised low-spots (cold), swamps/muskeg vs slightly higher ground, etc, etc, the siting of your winter camp is not just optimised by looking at one variable, that is proximity to the firewood resource. Of course, working onto a log or a stump can be utilised sometimes but often, in winter, in deep snow, the technique shown here is useful when no others are available. 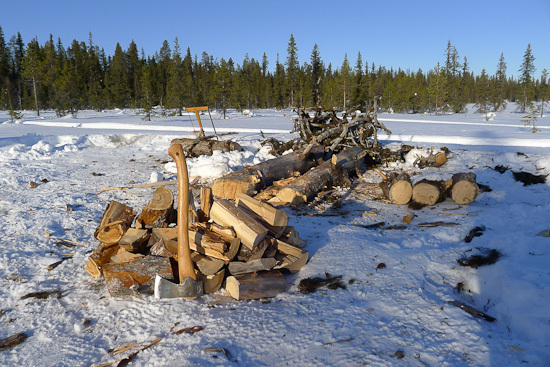 The title of the piece is indeed How To Split Firewood On Snow, not a complete treatise on winter axe techniques or firewood preparation. Hi Paul! I haven’t commented in your blog for quite sometime, it’s good to be back here! If it’s one thing that I haven’t done yet to this day – but would love to in the near future is to camp & process firewood in the winter season with its’ winter snow. Been longing for that for so many years – like a lifetime! However, I am still living here near the equator & living it out with the warm tropical weather with jungle bushcrafting here in South-East Asia, philippines. Again, I would so love to experience what you have shared to us in that video & Thanks so much for sharing Paul! Cheers! Longing for that chance from my Outdoors Bucket-List… Gary K. from Sout-East, Asia. I don’t know how old this film is but it’s still relevant today, it seems your films and posts do not age, if you put your posts in a book it would be as relevant in twenty years as it would be today. Cheers Nigel. Yes, it’s one of the first videos I made, filmed on only a compact camera. But yes, even though the camera technology changes, these classsic skills remain as relevant as ever.